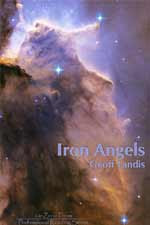 Iron Angels is the long overdue, first collection of poetry by Geoff Landis. Landis, a scientist at NASA Glenn Research Center, has already won the Rhysling Award for his poetry in addition to the Hugo, Nebula and Locus Awards for his works of fiction. Landis' background, intelligence and sense of humor are very evident in this collection. And while much of his poetry is profound, it always remains both accessible and engaging. These are poems for everyone, not just fans of science and science fiction. This collection also has numerous poems that, on the surface, seem straightforward and direct, but imply much more than what is being said. Consider "After:"
There is much humor and wit here, as well, such as in the award-winning "Christmas (When We All Get Time Machines)" and the quite useful "Ten Ways to Tell if Your Cat is a Space Alien." And yes, if you don't know what your feline friend is up to right now, maybe you'd better check. All in all, an excellent collection and valuable addition to anyone’s bookshelf. Cover Art: NASA, ESA and The Hubble Heritage Team. Cover Design: Heidi Della Pesca. (vanZeno Press) Reviewed by J.E. Stanley. Anybody interested should know that it's available at Mac's Backs. Or, if you want more information, or want to buy a copy on the web, you can find it at www.ironangels.net, or on the VanZeno website. Why don't modern poems rhyme? The cliches of contemporary poetry?